McAfee or Avast, which antivirus software is a better option in 2019? Read this comprehensive, data-driven comparison to make a smart choice. 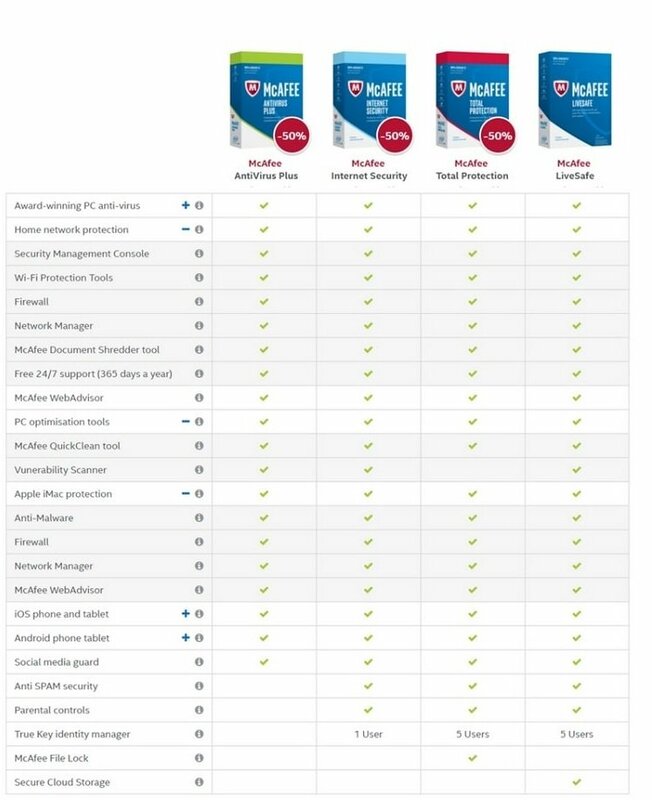 In this comprehensive McAfee vs. Avast guide, you’ll see the different antivirus suites (plans) both companies offer, the features and extra security tools included in each one of them, and how they compare to each other in great detail. If you’ve ever been affected by malware (short for malicious software), you know how it feels like to know that your banking details are no longer a secret or that your login credentials are compromised. I know, even the thought of it can give you chills. In the modern, digital world, you need to take extra measures to make sure you’re safe from the repercussions of the acts done by the dark internet forces (a.k.a. the “hackers”). 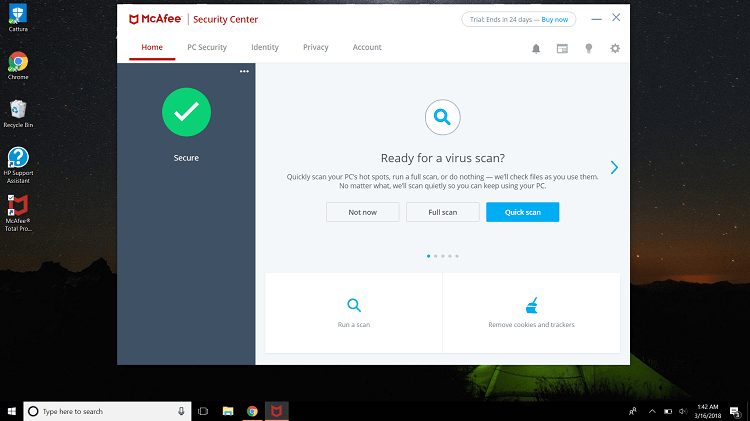 First, let’s look at the different suites McAfee and Avast offer for home-based Windows and macOS users. If you’re in a rush, you can just look at the infographic below that neatly summarizes the whole comparison. Both Avast and McAfee offer several feature-rich antivirus suites to meet your protection needs. Independent tests prove that both software provide top-notch protection against all sorts of malware threats, but McAfee is slightly better than Avast in terms of the impact on system performance. What’s Included in McAfee’s Antivirus Suites? McAfee doesn’t offer a free antivirus software. Its basic product, called McAfee Antivirus, is a Windows-only product that provides essential protection, along with several extra security-related features and utilities. A two-way firewall (monitors network traffic and prevents web-attacks) and a file shredding tool (deletes your sensitive files permanently so no one can recover them) are the two premium utilities that most companies usually reserve for their top-tier suites, but not McAfee. It generously includes both of these tools in all of its antivirus products, making its lower-end suites a step ahead of the competition. A vulnerability scanner (checks for outdated applications that might cause security issues), a QuickClean tool (lets you free up disk space and improve PC performance), and a game/silent mode feature (suspends notifications for interruption-free experience) are all part of McAfee Antivirus. McAfee’s active social media monitoring technology, which is also included in the basic suite, blocks inappropriate content and malicious links. Next level up is McAfee Antivirus Plus. With a single subscription of this plan, you can protect an unlimited number of Windows, macOS, Android, and iOS devices. It’s an excellent deal if you want to protect multiple devices in your household that are running on different platforms. An intuitive Security Management Console and a Network Manager are also part of the “plus” plan. The former helps you manage all your devices at one place, control which devices have McAfee protection, and locate/lock your stolen (or missing) devices, while the latter stops intruders and hackers from taking over your network. Another level up is McAfee Internet Security. It adds an anti-spam filter (blocks junk/phishing emails) and also has parental control features (keeps kids safe while they surf the web and prevent them from seeing objectionable content). And of course, all your Windows, Andriod, macOS, and iOS devices are covered with a single subscription of this plan, too. With the “internet security” plan, you also get a single license of powerful True Key identity manager. It stores your usernames and passwords in one location for hassle-free logins. Advanced features like facial recognition and two-factor authentication are also part of this tool. At the top of the pyramid are two top-tier plans: McAfee Total Protection and McAfee LiveSafe. The former adds a File lock feature to “internet security” plan, while the latter adds a secure cloud storage space of 1GB. Also, both of these top-drawer plans offer 5 True Key licenses. No matter which McAfee plan you’re on, you get premium 24/7 customer support and a virus protection guarantee (if malware somehow sneaks into your system, McAfee experts will remove the malware or give you a refund) if you sign up for the automatic renewal process. For safer browsing experience, McAfee offers a useful free WebAdvisor browser add-on (only available with paid suites). It blocks malicious/phishing websites, scans downloads for malware, and also has typo protection (redirects you to your correct destination in case you mistyped a web address). Another little useful browser extension that McAfee offers is Secure Safe Browsing. It also checks for a site’s reputation, malware and phishing history, and more. A rescue disk option (to remove deep malicious infections), a Virtual Private Network (VPN), and protection against webcam spying are not part of any McAfee suite. 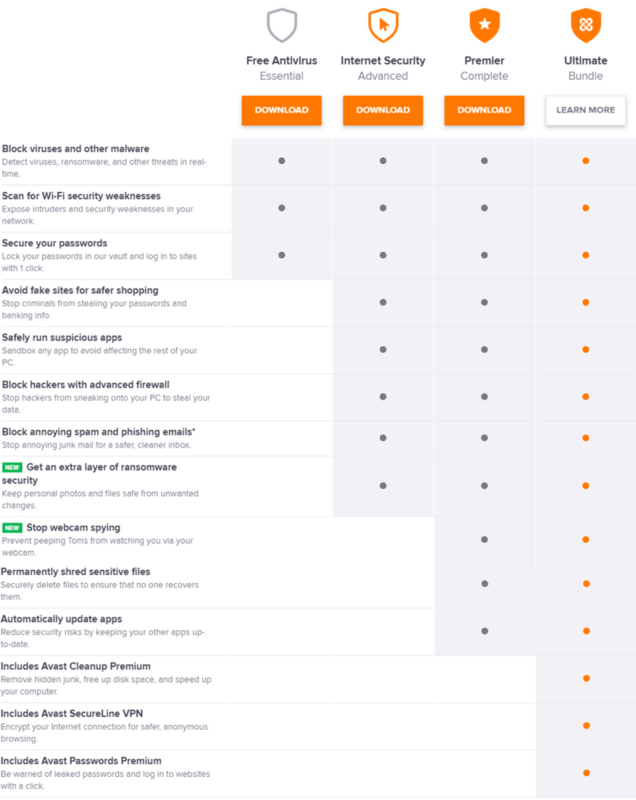 What’s Included in Avast’s Antivirus Suites? Avast offers separate products for Windows and macOS. First, I will cover the Windows-only suites. It not only provides great protection against known and unknown malware types, such as viruses, spyware, ransomware, Trojan horses, but also packs many security-related utilities and tools that are extremely useful. A WiFi Inspector (finds vulnerable networks/settings and also checks for intruders), a limited Software Updater, a password manager are all included in the freeware. If you want to run it alongside other antivirus application, you can set it to run into passive mode. A gaming mode feature and a rescue disk utility are also part of the freeware. Next up is Avast Antivirus Pro. It adds Sandbox technology (allows you to run potentially dangerous files in an isolated environment), a Real Site feature (prevents hackers from controlling your DNS and redirecting you to fake websites to steal sensitive details), and premium customer support. Avast Internet Security represents great value for money; along with all the features that come as part of the “pro” plan, you get an advanced firewall, an anti-spam filter, and extra protection against ransomware attacks. The next level up is Avast Premier. It takes security up a notch by further adding a Data Shredder, an automatic app update feature, and protection against webcam spying. Avast Ultimate is the company’s top-notch suite. In that, you get every feature jammed into the “premier” plan plus a Cleanup utility (removes junk and optimizes system performance), a VPN, and a premium password vault. Avast Security and Avast Security Pro are two plans that Avast offers for macOS users. The former is a freeware that only provides basic level malware protection, along with web & email shields and a WiFi scanner (scans for vulnerabilities in your network), while the latter includes protection against ransomware and also adds a useful WiFi intruder alert feature (immediately notifies whenever someone connects to your network). Other utility tools like Avast Passwords, Cleanup Pro, and SecureLine VPN are all available as separate products for Mac users. You can also avail the free trials of these utilities. The two browser plugins that Avast offers are Online Security (improves security while you surf the web) and SafePrice (shows the best offers to help you find the cheapest deal online). McAfee vs Avast: Which Software Offers Better Malware Protection? Malware can be classified into two major types: known malware (or widespread malware) and unknown malware (zero-day or previously unseen malware). It’s much easier for the antivirus program to catch known malware – malware for which digital signatures are already available. All it has to do is to compare the suspected file against a huge library of malware definition files (called signature-based detection). But for identifying zero-day malware, it has to rely on behavioral monitoring (checking how a particular piece of code behaves) and other complex techniques. Any file that seems suspicious is usually uploaded to cloud servers for further testing and, if confirmed to be malware, it is then added to the malware database and immediately sent out to the users in form new definitions. Now that you know how antivirus programs operate, let’s see how McAfee and Avast fared in the most recent independent lab tests. Germany’s AV-Test and Austria’s AV-Comparatives are two well-respected security institutes that regularly test various top antivirus solutions on different levels. In the AV-Test’s most recent Windows 10 evaluations, which were held in two rounds of tests (in November and December 2017), all antivirus products were put to test against 185 zero-day malware samples and 10,684 widespread malware samples. McAfee did an excellent job; it scored a perfect 100% against both types of malware samples in both months – earning an excellent 6/6 star rating from the experts in the ‘protection’ category. It only registered one false positive (falsely identifying legitimate software as a malware) in both months, securing another 6/6 star rating in the ‘useability’. Avast did a fantastic job, too. Other than a slightly lower but acceptable 99.9% protection rate against widespread malware in the month November, its results were flawless. It also registered a top-notch 6/6 star rating. But Avast returned with 4 false positives over both months, which means it received a slightly lower 5.5/6 star rating in the ‘useability’ category. Similar tests were conducted on Windows 7 platform in July and August last year. Both McAfee and Avast came up with a perfect 6/6 star rating in the ‘protection’ category. 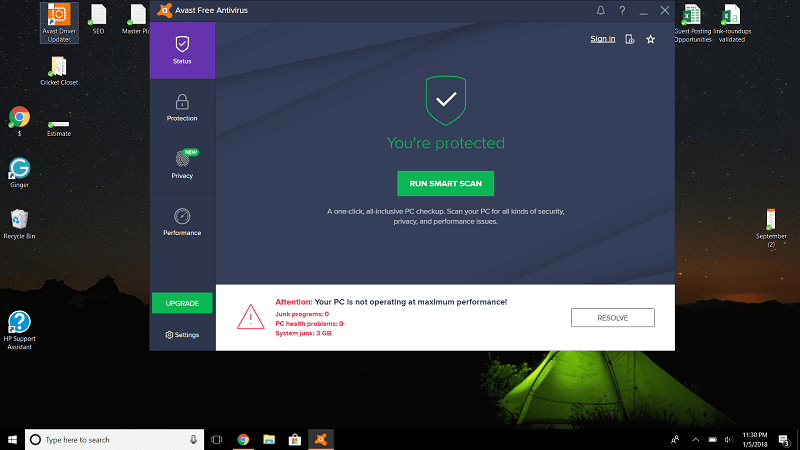 But Avast once again returned more false positives than McAfee, registering a 5/6 score in the ‘useability’, slightly lower than the McAfee’s 5.5/6 star rating. The experts at AV-Comparatives do two major tests to gauge the protection level of different antivirus products: Real-World Protection Test and Malware Protection Test. The former tests the product’s real-world protection capabilities with their default settings (including on-execution protection features), while the latter assesses the program’s ability to protect a system against infections by malicious programs before, after or during execution. 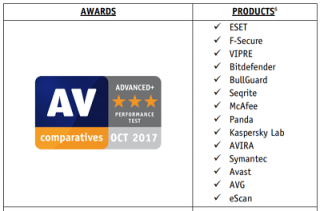 Interestingly, although both products received an excellent “ADVANCED +” award in both tests, Avast came out with slightly better results than McAfee — contrary to what we saw in the AV-Test’s results. 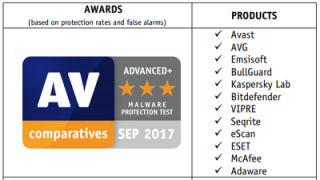 Avast’s protection rate was at an excellent 100% in the AV-Comparatives’ most recent real-world protection test — which took place in November 2017 — as opposed to the McAfee’s 98.9%. But Avast registered 3 false positives in the test while McAfee returned only one. In the malware protection test, which was most recently held in September 2017, Avast once again led the way with a near-perfect 99.99% protection rate while returning 9 false positives. McAfee’s protection rate was a shade lower that Avast’s, at 99.86%, but it only rang 2 false alarms. McAfee vs Avast: Which Software Puts Minimal Impact on System? It is imperative that an antivirus software should not eat up a lot of system resources, which eventually impacts system speed (or system performance). Once again, I will look at the independent tests to find out which software is better in terms of occupying system resources. AV-Test’s performance test measures the influence of different antivirus products on computer speed while carrying out common tasks, such as opening popular websites, installing/downloading few commonly-used apps, copying of files. The latest test, which was held in Nov-Dec last year on Windows 10 platform, saw McAfee score a perfect 6 out of 6 rating. On the other hand, the results weren’t as perfect for Avast as it could only manage a 5/6 star rating in the test. antivirus products – including Avast and McAfee – took part in the testing which gauged their impact on system performance by carrying out common tasks, like archiving/unarchiving, file copying, browsing websites, installing/uninstalling applications, and more. Both McAfee and Avast got the top honor, which is the “ADVANCED +” award, but McAfee’s impact score (the lower the better) was 7.3, which is considerably better than Avast’s 8.9. So, it’s clear from the independent tests that McAfee is slightly lighter on system resources than Avast, but the latter is not far behind in this race. McAfee vs Avast: Which Software Provides a Better User Interface? McAfee’s interface has recently gone through a major improvement; it’s now simpler and brighter, in colors of white, grey, and pale blue. The Home window is where you land when you open the interface. You will see your protection status on the left side, along with quick links for running (or scheduling) scans, setting up True Key identity manager, and cleaning your browser cookies and trackers. The PC Security tab lists all the modules (or operations) that are currently active, such as a firewall, real-time scanning, and automatic updates. You can run a quick or a full PC scan directly from this page, too. The Identity tab lets you control the settings of the McAfee’s Anti-Spam filter, a file shredder and the WebAdvisor (available as a separate download). The last two tabs are Privacy and Account. The former includes parental control features along with links to few other features, while the latter tells about the plan you’re on and the number of days remaining in your subscription (or trial if you’re on that). Avast modern-style interface follows a dark color scheme and looks neat, simple, and intuitive. Along the left, there’s a horizontal menu which has the following tabs: Status, Privacy, Protection, and Performance. The other three tabs (Protection, Privacy, and Performance) contain relevant features and their settings. At the bottom-left, there’s a link which takes you to the settings page. Note: If you’re using the free version, Avast will show you unobtrusive adverts and promotional offers to get to upgrade to the premium plans. Overall, both software offer a simple, easy-to-use interface, so it’s a tie in this category. McAfee vs Avast: Which Software is Cheaper? Overall, it can be said that Avast’s suites are a touch expensive than McAfee’s. McAfee vs Avast: Which Software is a Popular Choice? According to Avast, its user base is “over 400 million strong,” while McAfee claims to protect over 325 million devices daily. I will look at the most recent independent market share statistics, the total number of overall downloads on CNET’s download.com, and the social media influence of both software to decide the winner in this category. OPSWAT releases monthly reports on the market share occupied by different antivirus companies. According to their most recent report, which came out in January 2018, Avast is currently leading the market share by a whopping 19%, followed by ESET (14.03%) and Malwarebytes (12.73%). McAfee is fourth on the list, with a market share of just 8.41%. On CNET’s download.com, which is the world’s most popular software download hub, Avast once again leads the way with significantly more total downloads than McAfee. If you look at the social media following, Avast has a greater community on Facebook; it has 4.1 million Facebook fans while McAfee’s tally is just over 0.8 million. On Twitter, though, McAfee wins the race with over 801K Twitter loyalist, as opposed to the Avast’s only 181K. Overall, after considering all the statistics and numbers, it can be said that Avast is more popular among antivirus users than McAfee. Avast and McAfee are two well-known and respected companies in the antivirus realm. You have overlooked the McAfee bug that causes it to use 99% of your CPU and requires removal and reinstallation to fix. Then it comes back. You can find discussion of this problem on a number of forums. It took me several hours to fix when it happened. Bugs like that come up every now and then. I believe McAfee has fixed it, so it’s not really a problem.